1.5x Full Sheet Magnifier with Folding Stand - Magnify reading material and other objects while keeping your hands free to hold items and work! This Full Sheet Magnifier with Folding Stand is a convenient and functional portable page magnifier visual aid that offers 1.5x magnifying power and hands-free use. It sits directly on top of your reading material, allowing you to see text or tasks clearly without having to hold the magnifier. For added visual aid convenience, it also has a built-in cord so you can hang it around your neck and more easily view items held in your hands. This full page stand magnifier for the visually impaired is great for reading books, newspapers and magazines, as well as viewing mail, including bills, checkbooks, etc. And it is a handy tool for coin and stamp collecting, needlework, jewelry repair and countless other hobbies and household tasks where you would benefit from hands-free magnification. And when you're done using it, simply fold it closed for storage or travel. 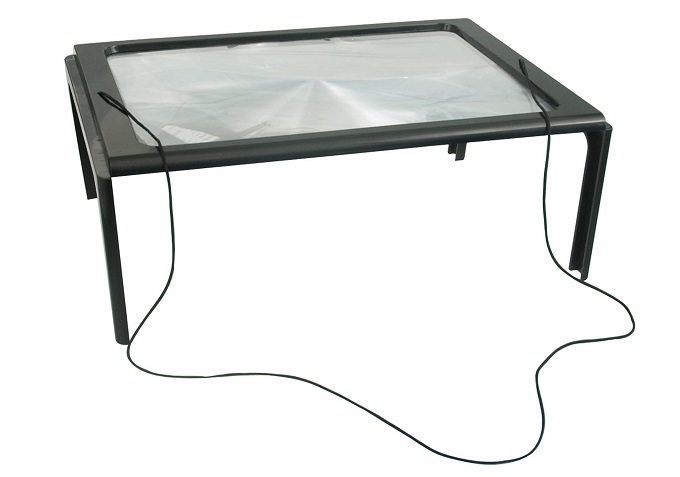 It's compact and lightweight with an ultra-thin clear acrylic Fresnel lens mounted in a black plastic frame with folding legs. Easily tucks into almost any briefcase or backpack.